Gamers bags the top score in different games to be on the top of the leader-board or to win the prizes. But the Bagra Game developers from Digital Mania had raised the award in a unique way. The developers gifted the top scorer with the real cow called “Pamela”. 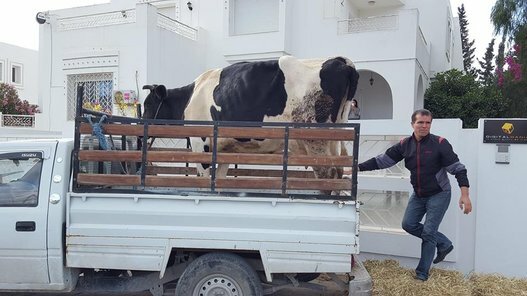 The name Bagra resembles the meaning “COW”, the winners had received the Pamela at the digital mania headquarters Tunis at the beginning of the may. Reported at the tuniscope website. The Game is available for the Android and IOS platforms and the top scorer from the both platforms had driven the cow to their home. The Digital Mania CEO Walid Sultan Midani also said the winner have a choice to receive the cow alive or they can donate it to charity or claim the prize as the raw meat. Luckily, Pamela was taken alive and had the happy ending. Digital Mania developers were glad to see Pamela driven to the winner’s home in the pick-up truck. They were thankful that the winners had chosen the primary option. The runners in the current game had given the gadgets as the prize. In this Game, the players can able to purchase the activities present in the game. The purchases have to be done in the local currency Tunisian dinar instead of US dollars. If you are excited and willing to join in the game, the next award is in the lineup. Its another Cow Brigitte. Brigitte’s life is yet to know, how the winner is going to choose to take the Brigitte.